The ship’s crew members turn to the railing as it explodes into splinters. Within a wave of water and foam, a massive sharklike creature lands on the deck and bites off a shocked sailor’s arm. It laughs cruelly as it claws its way forward on four scaly feet, with its long tail lashing behind. Its movements shower the area in blood. 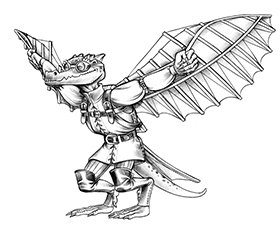 Inhalation (Su) As a move action, in a 20 ft. cone on land and a 40 ft. cone underwater, a fang drake can drag creatures toward it with a mighty breath. Creatures within the cone are pulled adjacent to the drake and are stunned for 1 round. 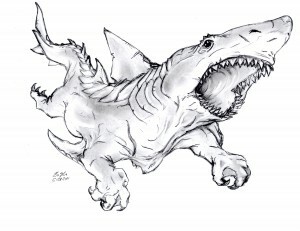 Creatures may attempt either a DC 15 Fortitude check or DC 25 Swim check to resist; success means the creature is drawn only 5 ft. toward the fang drake and is staggered for 1 round. Maiming Bite (Ex) Instead of dealing its normal bite damage if it maintains a grapple with its bite, a fang drake may make a new bite attack at a creature it is grappling with its mouth. It threatens a critical with this attack on a roll of 19–20 and gains a +4 bonus to confirm a critical. If it confirms the critical hit, the creature takes the critical damage as normal and it loses one limb (drake’s choice). If it misses with this attack, or hits but doesn’t make a critical hit, the target is no longer grappled. The exact effects of limb loss are up to the GM, but should be severe. For suggestions, check out the loss of a body part rules here. This is very cool, Chad! I’d maybe allow a Fortitude save to avoid the stunned condition from inhalation, otherwise things could get nasty for the PCs. Nice work Chad. I agree with Morgan that the CR is a little low. But beyond that I thought the fang Drake was a good creature. The automatic stunned condition is a big deal, though, especially at CR 4 and with how it’d lead you to drop weapons underwater.. yikes! 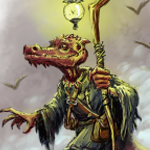 My take is to switch it to DC 15 Fort/DC 25 Swim with failure meaning the character is stunned for 1 round and drawn next to the creature and success meaning the character is drawn only 5′ towards the creature and staggered for 1 round. Still quite menacing, but less automatic with the weapon dropping. Did I miss a memo somewhere? What are the geographic and esoteric types? They are defined in the Book of Drakes. Thank you all. I agree that the Inhalation ability is a little strong. What you’ve suggested Jason would work better and I’d recommend everyone use that ability as you’ve written it. Actually, Miranda, if it wouldn’t be too much trouble could you fix it like this? Also, thank you on the compliments to the artwork. My brother, Brett Middleton, drew this and my other submission and I’m hoping to get him to do more for us if possible. I adjusted it! Let me know if you want any further tweaks! To tell the truth I would like to know more about positive things that are really fine for me. I really want to get the information like that. Come here to get the right things that you need to get.